Front Parlor - Traditional - Living Room - New York - by Neuhaus Design Architecture, P.C. Construction Manager: Interior Alterations Inc.
Ceiling Height - What is the parlor's ceiling height? The flat areas of the ceiling are actually painted the same as the wall color, Benjamin Moore "Old Prairie" 2143-50 (walls: eggshell; ceiling: matte). This color is highlighted with "Moonlight White" 2143-60 in a satin finish on the woodwork and plaster details. Thank you, very much, for your prompt response! Crown Molding - Hello! I am putting together a baby nursery. Where can I go to find over-the-top molding, like this? I may not go quite this extravagant, but I would like something "wow"! Any help would be appreciated. Thanks! That old house had wonderful bones to work with. It was great fun to restore for 21st century living. This room is beautiful! Can I ask the paint colors for walls and moldings? This would be perfect for my historical house. Thx. I LOVE this room and noted the paint colors- could you let me know where in the room each color was used? Thanks! The top detail work on the walls. - Is this a plaster treatment? I am trying to find more pictures of plaster treatments from this same time period. I found some behind wood paneling. 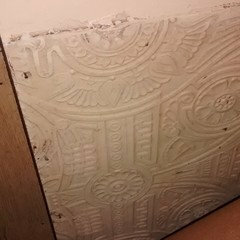 I am restoring the plaster and am trying to date it. My house is 180 years old. Where did this chandelier come from? - Wondering if this is readily available or an antique. It would fit perfectly in my dining room in the house we are building! 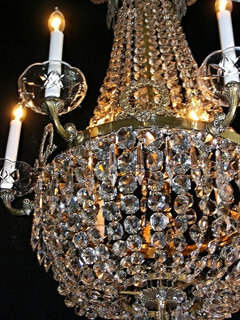 We can fabricate this beautiful chandelier for you. It will look and feel very similar to this. Contact me if you are interested. glass coffee table - Who makes the glass coffee table? Anyone from JP warren able to say, where did the coffee table come from? Thanks! The coffee table is vintage and by French designer Michel Mangematin. Wall colour - Can you please tell me the colour that was used on the walls? The wall color is Benjamin Moore's "Old Prairie" 2143-50, in an eggshell finish. What would be the SW or Valspar equivalent for BM Old Prairie? Tile? - Where did you get the beautiful tile surrounding the fireplace? Thanks for your question. That fireplace surround is actually marble with an applied ornamental pattern. It likely dates to an early 1900s renovation of that room. I'm sorry that I don't have a source for you. coffee table is beautiful, manufacturer? The walls were painted Benjamin Moore's "Old Prairie" 2143-50, in an eggshell finish. Who makes the sofas? What are they called? How high is the ceiling in this room, please? The ceiling in this grand room is a full 13' to the flat areas between the decorative mouldings. Where can I buy the basket/bowl on the pianp? Hi, you can check http://www.etsy.com/search/vintage/home_decor?q=wire+baskets&view_type=gallery&ship_to=ZZ&min=0&max=0 for good collection of these type of baskets. Wonderful proportions. - You mentioned the ceiling height is 13', do you know the approximate size of the chandelier?? It appears to be a very large fixture but works wonderfully in your space! Paint - What color was used for walls and plaster moldings? Please take a look at our reply to another question from September 29th, it has the detailed breakdown of the colors used. Ceiling - How was this ceiling made? It is absolutely beautiful!! Cocktail table - Who makes the cocktail table? Lovely! The table was purchased by the owner, who is an interior designer. Please contact JP Warren Interiors through their Houzz profile for more info on the table. Vase on piano - Can you tell me where you got the vase on the piano? Lovely! Hi, the vase belonged to our client - Jessica Warren - who was the interior designer. Her company is JP Warren Interiors if you'd like to query her directly. is a link to the Tacchini website. Paint - What color are the walls? They are beautiful! Who is the manufacturer of this gorgeous chandelier? That beautiful chandelier is an antique that the owner brought with her from her previous home. Does anyone know who makes the couches? Thanks. Tacchini Happy Hour -- available at Orangeskin in Chicago. Wall and accent colors - we have an older territorial on two glorious acres in Cave Creek. We are saving for a Roche Bobois sofa in a light gray leather. How would you suggest decorating around this beauty? We have put a window wall at one end of the room so there is a great deal of light. Sofas - Where can I purchase the sofas? A beautiful, grand room!What colour and type of hardwood would you - suggest in a new build to accomplish this classic look.I see some homes use dark hardwood but they are difficult to keep clean and this flooring looks like it would be easier to maintain but is georgeous.Your help is appreciated. Neuhaus and her team were presented with the challenge and responsibility of the renovation and preservation of an important neighborhood landmark. With historic architecture renovations, maintaining complete period authenticity presents itself as an obvious solution. But that often feels quite dated, and perhaps too thematic. Instead, Neuhaus created a hybrid solution fusing contemporary and period design that blends the architectural heritage of the brownstone with its inhabitants' modern perspective and lifestyle.The house exterior and architecture was treated as a metaphorical envelope and would retain its period integrity. Interior features like the cabinetry, bathrooms, furnishings, light fixtures, staircase, etc. were seen as the contents of the envelope and therefore could serve as contemporary insertions into the space. Pangaea Interior Design, Portland, OR added this to Crown Molding: Is It Right for Your Home? This may be the look you dream of when you think of crown molding. Super wide, heavily ornate moldings just knock my socks off. But are they right for your house?Consider the home style and ceiling height.This molding works because of the large scale of the room, the high ceilings and the size and detail in the other moldings around the fireplace and the baseboards. The overall style of the architecture is very traditional. If you have a very contemporary house or a mid-century modern California ranch-style home, crown molding of any kind may look completely out of place. If you love ornate crown molding in a traditional home, but also like contemporary style, consider keeping your furnishings simple with clean lines and very little pattern. The architecture will stand out while still giving you a space that feels serene.High ceiling tip: For ceilings 10 feet tall or higher, consider a rule of thumb allowing 1" of width for each foot of ceiling height. This isn't a hard and fast rule, and it doesn't work for lower ceilings. You wouldn't use an 8" wide molding in a room with 8' tall ceilings, for example. 5. Crown jewels. Elevate your living room to royalty status by easily applying decorative crown molding to create a noticeable presence. 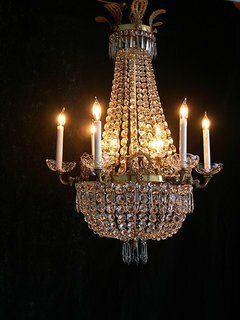 Add a gorgeous chandelier for that final touch of bling that might make even her majesty envious. When it comes to living spaces, make sure your design plays against the architectural details you already have in the room. 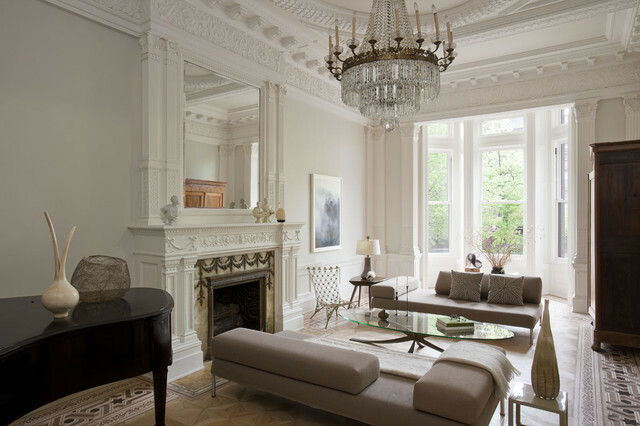 For instance, this space boasts incredible details in the crown moldings, crystal chandelier and fireplace treatments. The designers have successfully offset the classical background with a few very modern and minimalist pieces of furniture. Height and scale also play a big role in eclectic style. The designer lets the floor-to-ceiling windows, empire chandelier, piano and opulent molding take center stage here while furniture plays second fiddle. Hulking pieces not only would ruin the verdant view, but they'd make the room look overly serious. Instead, low-slung modern sofas and a short glass-top table nearly fall away — and let the room convey elegance without being too precious. The standard rule of thumb for incorporating mirrors is that the mirror should be roughly two-thirds the width of the piece of furniture over which it hangs. The distance from the floor to the top of the mirror should be no less than 6 feet. Dealing with big, dark pieces of furniture isn't easy. In this photo, the piano, firebox and tall wardrobe balance each other in scale and placement in the composition to ground the photo. The photo is almost bookended by the dark objects on the left and right.Tip: All of the lights are off in this room, so the viewer focuses on the natural light streaming in from the bay window. This is a trend in today's interior and architectural photos.